Another year has come to an end filled with enjoyment, sleepless nights, hard work and engaging in all nighters, all of this effort is finally paying off with the examinations approaching. Most students put in a lot of effort into their preparation in order to score and perform well. Students have a common goal in mind i.e. to pass with good grades and if possible even with flying colours. However, the exam brings with it the age old excitement as well as a new sense of anxiety as students prepare to face the HSC (Higher Secondary Certificate) Board Examination that pave the way into pursuing courses that they desire and to gain admission into a reputed institute to lay the foundation of their career. The HSC Exams are conducted by the Maharashtra State Board of Secondary and Higher Secondary Education (MSBSHSE). This year the HSC Exam Time Table 2014 has been announced earlier. Thus re-leaving students of their distress. Students need not fret because the MSBSHSE has finally announced the HSC Exam Time Table 2014 , so students can now plan their preparation accordingly and with ease. Therefore here is the HSC Exam Timetable 2014. Russian (36) रशियन (३६) 3.00 p.m.
Are there any quick tips to score well in the examinations? Well there aren’t any short cuts to score well. But a thorough preparation is required. If you are looking for study tips or examination tips then our category on study tips and examination tips will be of interest to you. I finally found what I was looking for, thanx! Your welcome, glad to be of some assistance. 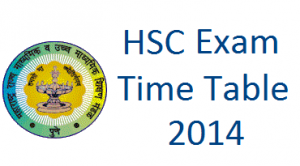 Thanks for HSC exam time table. Your always welcome. If you are looking for examination or study tips then our section on Study and Exam tips would be of interest to you.